Over 85% of pets 2 years and older show some sign of dental disease. Toy and small breed dogs are especially prone to dental disease. Periodontal disease is a painful, infectious disease that leads to the destruction of the tooth’s supporting structures. The bacteria can travel through the bloodstream and cause serious infections in the liver, kidneys, heart and lungs. Thorpe Animal Hospital offers regular dental exams and complete dental cleanings for pets including deep root cleaning, polishing, periodontal surgery and extractions. We can also help council you on a good home care program to maintain your pet’s oral health. Bad breath is the most common sign of dental disease noticed by owners. The build-up of plaque on teeth surfaces leads to gum disease. There are millions of bacteria in dental plaque; if the plaque is allowed to accumulate it irritates the gums and can lead to an infection of the bone surrounding the teeth. Dental tartar is attached to dental plaque and contains calcium salts from saliva. If the tooth surface is not kept clean tartar will begin to form in a couple of days. Dental tartar provides a rough surface that enhances additional tartar buildup. Once tartar begins to grow it is almost impossible to remove with brushing alone, typically dental instruments are needed to remove it. Once the gums become irritated and inflamed they will begin to bleed and cause pain. Some cats and dogs will begin to eat less or drop food from their mouths while eating. As dental disease progresses the roots of the teeth become exposed and can be so severely affected that the teeth will become loose and fall out. The bacteria in the dental plaque and tartar enter the blood stream; these bacteria can then cause infection and damage in the dog or cat’s kidneys, liver, and heart. Cats and dogs are not the only ones that require dental care. 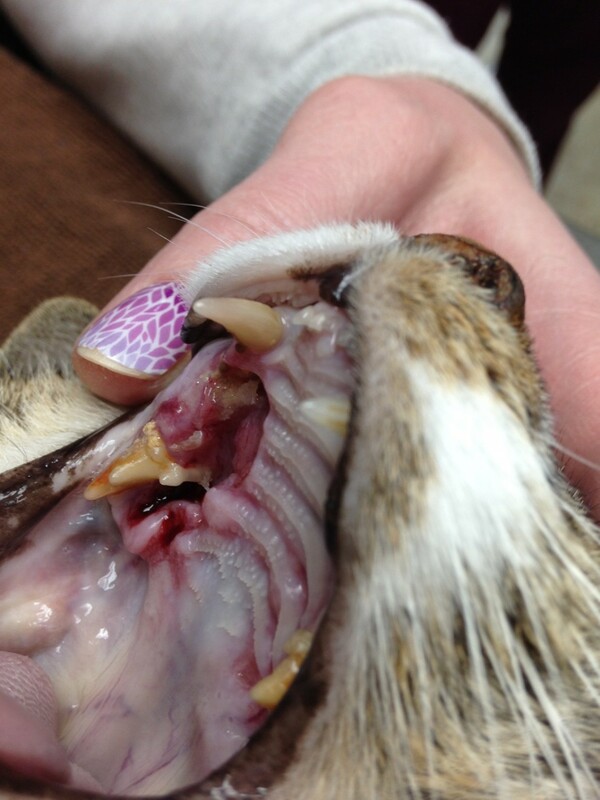 Small mammals such as rabbits and guinea pigs also need dental care. Their teeth continuously grow and may become too long and inhibit chewing. Their teeth may need to be periodically trimmed to support normal dietary function. What does a dental exam and cleaning involve? 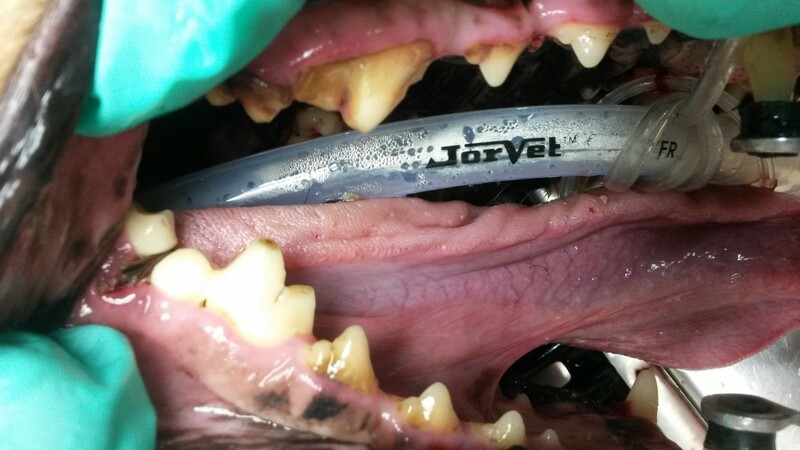 A dental exam involves a thorough examination of all aspects of your pet’s oral cavity including larynx, tonsils, pharynx, hard and soft palate, tongue, and all surfaces of each tooth including probing for periodontal pockets. Plaque and tartar are then cleaned off the teeth and the crown and below the gum line are polished and a fluoride treatment performed. A thorough oral exam is essential to any dental cleaning to determine the root of many problems. The cat in the picture was having chronic upper respiratory signs, sneezing, and mucoid discharge that never improved with antibiotics. She would not allow an oral exam while awake but while anesthetized we can see she had a very large area of ulceration that exposed parts of her nasal cavity. This is why a thorough oral examination is necessary while under anesthesia. Is dry food enough to keep my pet’s teeth clean? Dry food does help reduce tartar buildup; for some pets dry food may be all that is needed to keep their teeth clean. However, for most pets, dry kibble is not enough to prevent plaque and tartar accumulation on teeth. Once the soft plaque has turned into hard dental tartar, brushing alone will not be enough to clean the teeth. Dental tartar must be removed with dental instruments and afterwards the teeth should be polished to smooth out their surface. 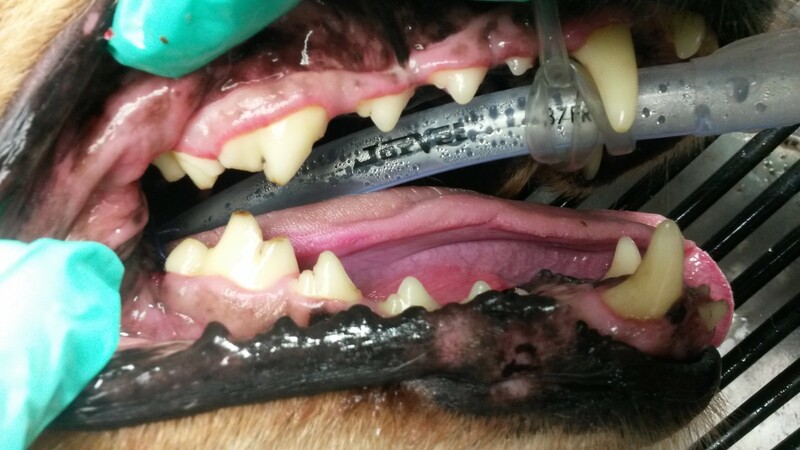 Why does my pet need a dental cleaning even when I brush her teeth and give her dental chews? For humans, brushing alone is not enough to keep all plaque and dental tartar off of our teeth. Your pet is the same way; although you are doing a great job brushing and providing great at home dental care, your pet will develop plaque and tartar that needs to be professionally removed. Bad breath may be a sign of periodontal disease which affects four out of every five pets.